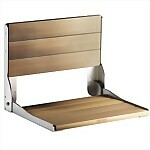 Fashionable shower bench with comfortable back is practical and elegant looking. 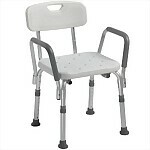 Includes a non-slip seating surface, adjustable legs, and removable backrest. 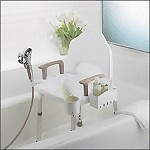 This bath chair includes an Add-On Handle Kit. 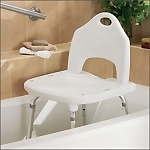 Durable and rust-proof bath chair with height adjustable legs includes removable arms and comfortable backrest for the ultimate in safety and comfort. 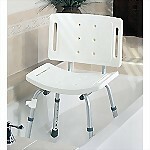 Elevated armrests make this bath chair safer when getting in and out of the shower or tub. 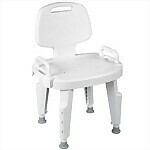 Includes backrest and comfortable, soft foam armrests. Quality composite construction is durable & rust-proof, featuring unique easy to use height adjustable legs, large non-slip feet, comfortable backrest and armrests with a weight capacity of 350 lbs. 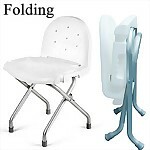 Contoured, durable bath chair with backrest provides comfort and support when bathing or showering and quickly and easily folds for storage and travel. 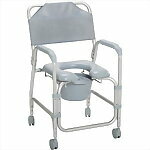 Multi-purpose, rust-resistant aluminum shower chair and commode includes 4" caster wheels for easy mobility and wheel locks for safety while in use. 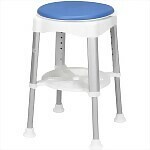 Deluxe rotating bath stool includes a padded seat for extra comfort while bathing. Seat rotates 360° and locks every 90° to reduce twisting and turning while in the shower. Features water-tight and easy-to-clean comfortable, cushioned seat and backrest with open front design for easy access for personal care. 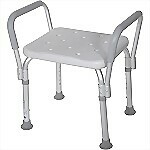 Rust-resistant aluminum frame is durable, yet lightweight and includes a textured, non-slip seating surface, contoured backrest, built-in handholds for easy transfers, and height adjustable legs. 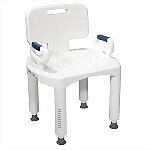 Elevated armrests make this bath chair safer when getting in and out of the shower or tub. 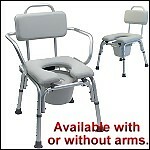 Includes comfortable, soft foam armrests. Shower safely with this ergonomically designed shower seat which includes a non-slip seating surface and 17" leg width to fit most tubs and showers. 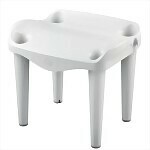 Unique Swivel Shower Stool can be rotated up to 360-degrees for easy entry/exit and locks in place for safety. 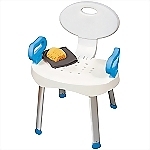 Includes a textured non-slip seating surface, non-slip feet, and under storage area for easy access to bathing items. This high quality, wall-mounted fold down teak shower seat provides the ultimate in comfort and safety without compromising style and beauty.